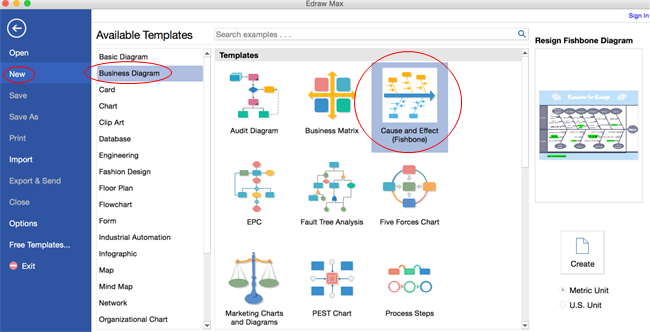 Create fishbone diagram on Mac with desktop diagramming software easily at lightning speed. Using built-in symbols or fully customizable templates to get started can doubtlessly beat time and effort-consuming hand drawing. In this step by step tutorial, we will show how to create fishbone diagrams. 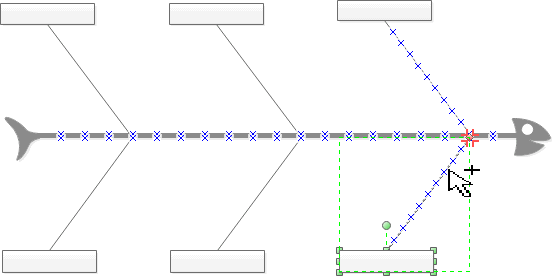 You can do it in a fairly fast and funny way with advanced diagramming tool. Auto connection helps you save tons of time and energy. Open a blank drawing page and the libraries including templates needed for creating fishbone diagrams on Mac OS X. On the File menu, point to New.-> Click Business Diagram, and then double click the icon of Cause and Effect (Fishbones). Drag and drop shapes from the left libraries. The Fishbone and Effect shape represent the spine of fish. The spine shapes are designed with connection points that allow easy connection. Move the category and cause shape to the spine, they are glued when the connection points turn red. Note: The category shapes help you group causes into different types. This helps you make the cause effect analysis more logical. 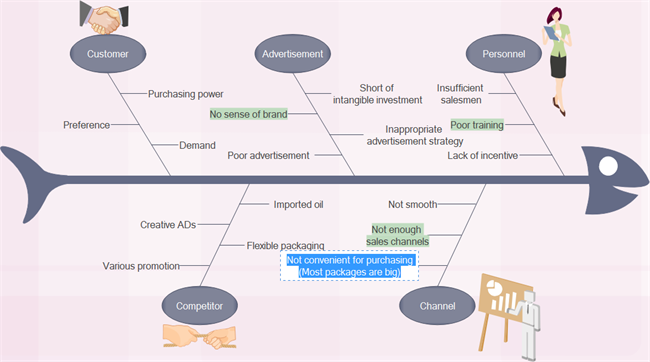 Causes can also be divided into different levels based on analysis requirements. Drag the primary cause shape out and connect it with the category shape. Drag the secondary cause shape out and connect it with the primary shape. 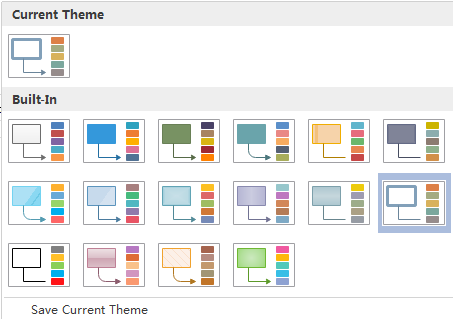 By changing Fishbone Diagram theme, you can enhance fill, line and text style altogether at 1 click. Hit Export & Send under File to export the fishbone diagram. You can choose to convert it into graphics, MS files, SVG etc. 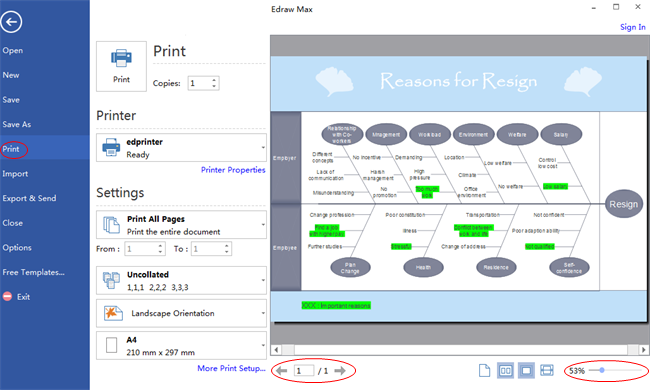 Click File tab and then choose Print. A preview of your document automatically appears on the right. 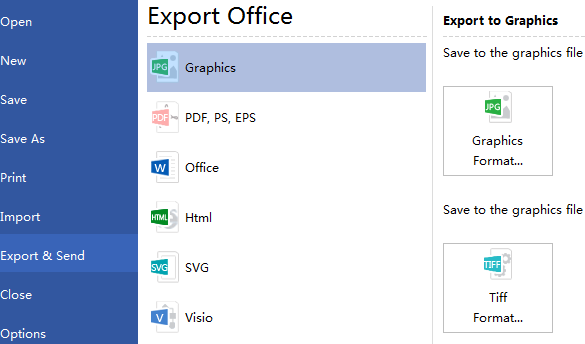 To go back to your document and modify it, click the top left arrow. Here are some fishbone diagram examples. They can help you get inspired and get started quickly to create fishbone diagrams. Try our fishbone diagram software for Mac for free.